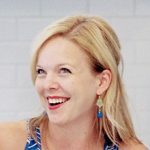 I first shared a margarita cupcake recipe back in the early months of this blog. They were cute and tasty, but they were basically just a doctored up cake mix. I’ve since come to avoid box mixes now that I realize just how easy and better tasting it is to make cakes and such from scratch. So, I had been planning to come up with an updated margarita cupcake, not involving a box mix, but before I ever got around to it Shawnda did it for me. 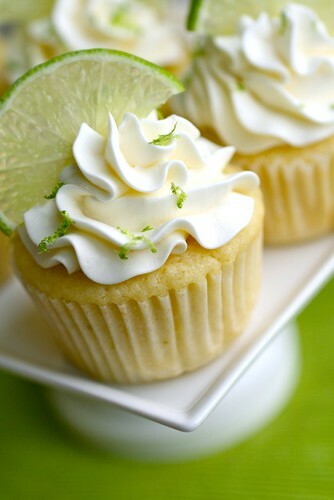 A basic lime cupcake topped with tequila-lime Swiss meringue buttercream – fantastic idea! Overall I really liked these and was happy with the way they turned out. However, I didn’t feel like the tequila flavor came through, which seems the important distinction between margarita cupcakes and regular lime cupcakes. I even brushed my cupcakes with a tequila simple syrup to help play up that flavor, but I don’t think it made a big difference. I have a simple fix though – next time, I will brush the cakes with straight tequila. I have a feeling that will have the effect I am hoping for. And if you are one who enjoys salt on the rim of your margarita glass, you might consider a sprinkle of coarse salt over the top of the cupcake to incorporate that flavor. These certainly are a fun and festive ending to any Mexican-inspired meal. Note: The most frequently asked question on this blog is what tip I used to frost my cupcakes. This particular tip is not labeled in any way, but is essentially just a large star tip. To make the frosting, combine the sugar, egg whites, and salt in a heatproof bowl set over a pot of simmering water. Heat, whisking frequently, until the mixture reaches 160° F and the sugar has dissolved. Transfer the mixture to the bowl of a stand mixer fitted with the whisk attachment. Beat on medium-high speed until stiff peaks form and the mixture has cooled to room temperature, about 8 minutes. Reduce the speed to medium and add the butter, 2 tablespoons at a time, adding more once each addition has been incorporated. If the frosting looks soupy or curdled, continue to beat on medium-high speed until thick and smooth again, about 3-5 minutes more (don’t worry, it will come together, though it may take a very long time!) Stir in the lime juice and tequila and mix until fully incorporated and smooth. Keep buttercream at room temperature if using the same day, or transfer to an airtight container and refrigerate up to 3 days or freeze up to 1 month. Before using, bring to room temperature and beat with paddle attachment on low speed until smooth again, about 5 minutes. Frost the cooled cupcakes with the buttercream. Garnish with lime zest and lime slices as desired.